WHAT IS AMS? WHAT CAUSES IT? Acute mountain sickness or AMS is a condition caused by lower oxygen levels at high altitudes. When people from lowlands travel to high altitude, their bodies take time to adapt to lower oxygen levels. The heart and lungs need to make extra efforts to compensate for the lack of oxygen. And in this process can exhibit several side effects such as a headache, nausea, fever, giddiness etc. You might have a headache, feel dehydrated, feel nauseated, and face lack of energy due to low PO2 levels in the blood. We hope the following information helps you prevent AMS on your next high altitude trip! When you reach high altitudes in a short time, the blood gets thicker as more hemoglobin is produced. Therefore, the thicker blood makes it harder for the heart to deliver oxygen-rich blood to the body. Altitude sickness is like feeling hungover. AMS is the most common form of altitude sickness, and it’s the least dangerous. You can recover in a few days, provided that you take the necessary precautions. AMS is experienced by a lot of people traveling from Manali to Leh and that’s why we always recommend the Srinagar route to avoid AMS. Via Srinagar, you get to gain altitude at a less rate than the Manali route and it helps beat AMS! When you start experiencing AMS, you should stop climbing any higher, return to a lower elevation level or take a break for some time. Get medical help if possible. Sea Buckthorn is a small shrub that is known to grow in high altitudes of 7,000-15,000m above sea level in the Himalayan region. With Vitamin C, E, A and flavonoids, it serves as a strong antioxidant and has been found highly beneficial for people at high altitude. It is known to cure syndromes associated with high altitude sickness. You can also drink tea blended with thyme or peppermint, which are known to be blood thinners. These should prove in tackling AMS quite effectively. Acclimatization is a process of making your body adjust to the higher altitudes. It is advisable to spend two nights at the same elevation for every 3000 feet of ascend. The intake of oxygen molecules per breath gets lower as we move to a higher altitude. This is followed strictly by high altitude trekkers and mountaineers. Dehydration is a key reason for altitude sickness and is one of the most common reasons for AMS. At high altitudes, fluids move out of the blood and into the surrounding tissues. This is why many people tend to swell up or bloat as they ascend. Therefore, it is very important to hydrate oneself. Carry a bottle of water and take frequent sips, even if you do not feel thirsty. You can also add electrolytes to your water to help replenish minerals, salts, and sugars that are lost while traveling. This will help keep you from losing too much water and keep your blood thin! Caffeine and alcohol consumption at a higher altitude will increase the likelihood of dehydration. Smoking can lead to or worsen chest congestions and it’s best to avoid these as much as possible. Don/t overeat in the mountains. Eat small but frequent meals that are easy to digest. Grains, pasta, and bread are all recommended to help you adjust to a high altitude. Eat foods like beets, dark leafy greens, grass-fed meats, liver, lentils, raisins, black beans, and dark chocolate to naturally get in more iron into your diet. Avoid making Maggi your staple food; you need a well-balanced diet in the mountains. Train and get in shape! This is important especially for trekkers and they need to be in prime physical fitness to start climbing high altitudes. For others, lose weight, build your stamina and stop consuming alcohol and cigarettes at least a week before your trip. We have traveled extensively in J&K, Himachal, and Arunachal and faced AMS ourselves. 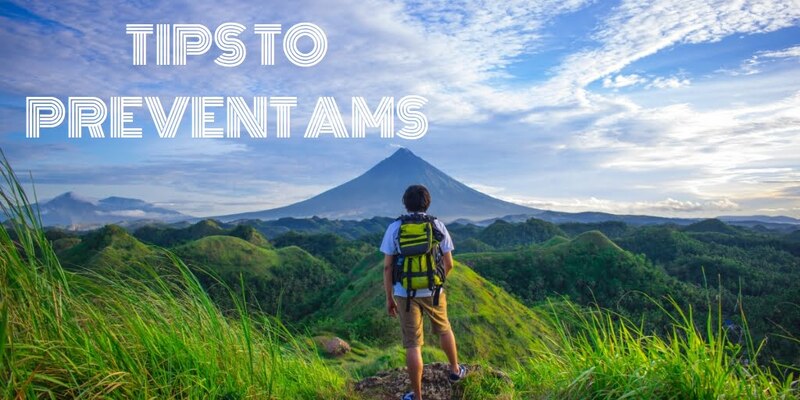 Through our experiences, we have devised the above tips to help prevent AMS. If you have any other helpful tips, do leave your comments below and we will include it here!